The best in mall make up is yours to discover with this startling beauty and her own personal cosmetician. Try on a whole new look for a fun adventure through fashion as you relax at the mall. Slip into a regal, comfy robe as you pamper yourself at this stylish day spa with a top notch make over, hair cut, manicure, and a trip to the sauna. Get some ink done with a stylish tattoo artist that knows her way around a tatty gun! Romantic red roses and hearts or saucy tribal designs are the cutting edge of cool now and forever! Kick off your World Cup celebrations in style! Be a part of the action and the glory as you dress this doll in all of the teams uniforms. It is the first day at work for this young professional. 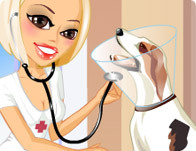 She is proud of wearing a new veterinarian uniform and she can't wait to help these animals get better! The best way to party with your best friend is a makeover party! Fun new hair, funky eyeshadow, and lovely lip gloss are great ways to re-up your style for a night out with your best buds. The bases are loaded with style and you're the designated home run hitter for this fun fashionable baseball team. So design an outfit that really knocks one out of the park! Her first child will be born into a world of fashion and fun! Join this mother to be as she redesigns herself in plenty of designer duds and pregnant friendly styles. This cool tomboy chick isn't constrained by gender norms. She knows that she can rock any outfit and make it look chic and cool. Help this girl get dressed up in some great and stylish outfits. Baby on the way means a whole new wardrobe! Show off that bump in style with empire waist and scramble print leggings! Get colorful and have fun for nine months of new fashion adventures! Kick out some rah rah rah emo jams with this one of a kind cheer leader and her pink purple, skull and broken hearted cheer team of pseudo goth, overly emotional fun time cheer dancers! It's style 101 with fun skirts, cute tops, and printed Ts. Turn the hallway into a run way with a too chic for school look and matching notebook/backpack accessories. Long, strong beautiful hair and curls that never end can be the centerpiece of any amazing outfit. Accessorize and draw all attention to your luscious locks! This beautiful roller skater is ready for some tricks on the half pipe! Do you think she's got what it takes? What does your family doctor look like? This friendly doctor is ready to get you well again! Take the doctor's orders to make sure you get back on your feet in an instant! Dress up this trio of sunbathing beauties for some South American fun in the sun! Get ready for girls day out! Hit the mall with your besties in you favorite outfits and strut it like you mean it. Go goth, emo, punk or plain jane jeans and a tee. They only see each other for an hour a day, but these 2 lovers know how they feel. Style this cute couple for their 60 minutes of daily pining and wishing in this romantic dress up. Splish and splash with these stylish underwater treasure hunters! Go deep and have fun with body suits, bikinis, matching goggles, and too cute fishy friends! She's fit, fun, and fashionable! Join in on Tina's gymnastic crew and get some tips in style as well as a great work out! Pick three young models and dress them up for tonight's big catwalk! Play doctor dressup with these fun nurse scrubs, stethoscopes and syringes. Get stylish with a matching hat and accessories! Let this beauty bar professional find your color and give you a brand new face! Make up is the first step in a head to toe make over that lets you take on the role of chic, trendy and totally fab! Get creative, fill this photo album with fun pictures and memories! Whether its Long luxurious locks or fabulous frizzy fro's, girls love curls! Jump into summer with a bouncy new do and a smilin' new you! Ready for some jumping and acrobatics? This gal needs to get a 10 from the judges and an attractive outfit is always part of a great performance. You're getting a manicure but not just any manicure, an Amazing Manicure! Pick a shape, a color, a size, a stencil. Throw in some jewels and round it all off with a matching ring and bracelet combo. Build a pyramid of fabulous fun out of your best friends! Cheer your way to the top and never look down with this stylish cheer leader and her bevy of best buddies. Ever dream of becoming a famous cheerleader? Now you can pretend with this super doll! Why wait to grow up and be just like mommy when you can do it right now! Your clothes, your hair, you can borrow every detail right down to the way you walk and talk! The sun is above you, the water below. Dive headfirst into an unforgettable summer of swimming, splashing, fun and romance! Your clients expect you to look great and come up with cool new looks every day! Dress up this stylish hair stylist! This smart and sophisticated school nurse will be there to help if you need her! Hit the clubs with your best bud in cute outfits and new hairdos! Dance all night and have the time of your life in a never ending party adventure in this fun duo doll dressup. Go for the glitter, feel the glamor and get married. Make sure your walk down the aisle is as glorious as possible in ice white gowns and decadent glittering jewelery. First impressions go hand to hand with good customer service. No matter the airline you travel with, expect a well dressed flight attendant just like this one! Welcome to the DressUp.com! The salon where Sandy Chic and her saucy sister Sara hand out the best haircuts, updos, and makeovers around in the most fabulous city in the world! This beautiful angel is preparing for her wedding ceremony, and although she hasn't seen her groom for several weeks, she still knows that he's going to love her wedding gown! What should vampire girls wear? This dark girl needs help creating the perfect costume for Halloween! Style this darling adorable little cutey in all sorts of diapers, booties, jumpers and more. Pick out a custom bottle and soother and watch him smile as he enjoys a day with his mother! Create your own look from a wide variety of custom tattoo designs and clothing! No 2 dolls ever look the same, what does your style look like? Dress up and hang out with this adorable duo of sisters as they gossip, read each other stories and goof around on a fun and fashionable summer day. Dress up professionally and help your clients see with perfect vision! Make sure they get their new glasses fit perfectly and look super chic and cool! What beats a wedding party? For these best friends nothing is better than having a great time with family and friends. Dress them all up and make sure the bride looks gorgeous! Give this swanky stylist a makeover while she creates a cool new look for a client. They'll both step out in new styles today! Give the girl an intimate look to impress her new boyfriend! Hit the beach in chic shades and hot bikini styles as you soak up the sun in an assortment of 1 or 2 piece suits with matching bags, sheer wraps, and cute hats. A fun dressup game with Jessica Rabbit from Who Framed Rogger Rabbit! Dressup this doll in all sorts of fancy outfits! Give yourself the gift of good fashion on your happy birthday! Fun with friends, family, cake and presents await so look your best and feel great. She writes about her life, her loves her fashion and her dreams. This blogging beauty is an undeniable force filled with fun and fashion. Pick a puppy or a kitty or maybe a hedgehog! Accessorize it to your favorite outfit and you've got Its fashionable fun for everyone in this pet friendly dress up. Be bright, be unique, be beautiful. Give yourself a pretty, rainbow hued new look and hit the town in this daring new dress up. Dress up Pippi Longstocking like you imagine her from the story books! She's as famous as Jack from the Giant's Beanstalk, but much more stylish! Join these 2 best friends for the ultimate staring contest to end all staring contests try to distract eachother with fashionable items of clothes and make up! Lay back and analog blog with this stylish cutie that day dreams about boys and best friends, school and hanging out. Pick out your own cute diary and take a break in the park or at home! She whips her hair back and forth as she flows infinite forever! Hot new RnB, hip hop sensation, Willow Smith is here to drop beats and spit hot fire! Style her in funky clothes and sharply cut hair! Small but stylish this chic stylist knows hair. Watch her whip up a new do for her best friend and dress them both up in a colorful assortment of fun clothes and accessories. Bev's first horse is a cute Pony named Princess that loves to ride, eat oats and hang out with her best friend! Take these two for a fashionable ride in chic outfits and matching tack and saddle wear! Tattoos are a permanent part of your style. This gal is trying to see what outfits best match her super chic flower and butterfly tattoos! Can you please help her out with your eye for fashion? Dress up and get ready for a college football match! GO TEAM GO! Can you help this girl go from geek to chic? Twins are twice the fun with an assortment of matching and clashing outfits and hairdos. Style these blue-eyed beauties with cutting edge hair and chic club outfits for some double trouble! Read your favorite books, play in the park, make a mess, and have a lot of fun with your favorite babysitter! Explore all the colors of the rainbow and give yourself a great make over! Besides brown and black isn't even in the rainbow! Sometimes you just need to take a break and take a long vacation. Let the ocean's waves relax you into oblivion as you soak up the sun and wash out the stress. Gorgeous gowns, various veils, and matching flowers can make any wedding unforgettable. Style this lucky lady for her big day! Take a stab at dressing up your favorite vampire! The incredibly handsome Robert Pattison from Twilight! She's a fierce warrior Queen with a loyal, lethal, and lovable pet! Meet The Dragon Queen and style her from head to toe in iron armor, deadly weapons, and royal gowns or scepter accessories! This mommy to be is looking for a fun new style! Fashionable shirts, skirts, and gowns cut for a tummy are on her radar! Dress her up in a stylish maternity cut get up! Travel to beautiful Iceland, enjoy long sunny summers and cozy winter nights! Put together a layered ensemble that will have the polar bears wishing they could change their coats once in a while. This is a comprehensive salon for the beauties. You can do your make-up and design your own fashion. All the beauties rush here to find a style that suits them best! New nails mean a new you. Bright colors, fun patterns, and glamorous glitter are the cutest finger sized accessory for any look. Summer means adventure and fun for this stylish duo! Dress up and fix your hair because the super crazy roller coaster is one ride you don't want to miss! Dress up this hip, happening young model in all sorts of chic clothes for a fun fashion show off! Hit the mall and strut your stuff in this fun cutting edge designer dress up. 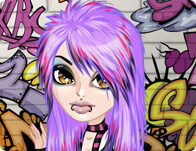 Cartoon doll Anime needs your help designing her new look, give her a haircut, make over and make her look great! Think fashion, think function, think fun! Go back to school in style with a chic new look and a cute new bag! Hit the mall in style with your crew as you bask in the sunlight and breathe in the sights and sounds of the worlds number 1 hot spot for being it all the time, Beverly Hills! Get made over in the colors of summer! New hair, makeup, and outfits tied together with cute floral accessories are the thing that's in this season! Schools out so jump into summer headfirst with a stylish ensemble of colors and fashionable fun. Get chic for your last day in classes and dance up a storm at the goodbye formal. Dress for adventure and keep your cool when things get hot! Swing away with this daring adventurer as she explores the mystery and beauty of Hawaii's tropical volcanos! Stylish, saucy, and a little crazy! Everybody loves colors so go nuts with rainbow hued hair and contrasting highlights. Get styled right for a night out or a trip to the beach! Bem-Vindo, Welcome to Brazil! Brazil is home to some of the best fashion in the world! Dress Up this Brazilian girl with the best clothes on the market! Silent, deadly and beautiful. She is a ninja princess covered from head to toe in stylish and traditional outfits as well as razor sharp weapons and armor. One piece, two piece, flip flops. Fashion shouldn't go away when you go to work especially if it's at the beach! With the release of the new Twlight film - New Moon, you'll love dressing up Robert Pattinson who plays Edward Cullen, the vampire, so that Bella will think he looks great! Molly is in the market for a modern and marvelous makeover. A styling new do, chic makeup, and a whole new wardrobe of fashionable fun! Make this makeover magnificent! Make some new memories and help this brother and sister duo look their best as they spend some quality time together remembering the past! How many little girls want to grow up and be a ballerina dancer? Now you can be! Dress up this cartoon doll in cute outfits for her big show! There is no better place to party than the beach, especially on a clear and warm evening with an ice cream or a fruit juice froyo! Or a pi?a colada maybe? It's time for a dance off! Choose your doll, compete against your friends and serve them up something nice! Drink in hand, feet in sand, smile on face. You are now prepared for the beach party of a lifetime. Look cute and stay cool in tons of darling dresses and beautiful bikini's. Help this Police Women look great while she keeps us safe! Customize your very own one of a kind pair of cute kicks! Bright colors, wicked weird decals and neon print laces explode off your feet in this fun and sporty take on foot fashions! Supergirl is ready to catch some villains! A great outfit is all what she needs in order to go out and fight the bad guys!